Deacon Frank Camacho is being remembered fondly for his compassion and reflecting the love of Christ to others. The longtime Director of Diaconate Personnel, as well as serving as a deacon for more than 14 years at Our Lady of Light Parish in Fort Myers, passed away March 29. He was 81. 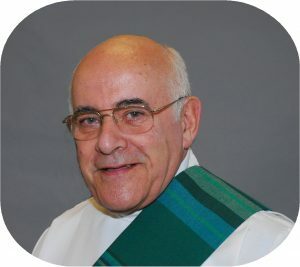 Deacon Frank J. Camacho, former Diocese of Venice Director of Diaconate Formation and Director of Diaconate Personnel, as well as serving for more than 14 years at Our Lady of Light Parish in Fort Myers, died March 29. He was 81. A Mass of Christian burial was held for Deacon Camacho on April 1 at Our Lady of Light Parish. The Mass was celebrated by Parish Pastor Father Hugh McGuigan, OSFS, and other priests of the Diocese. Along with Bishop Frank J. Dewane, more than 50 permanent deacons were present to honor Deacon Camacho for whom they had utmost respect. Bishop Dewane said that Deacon Camacho was a respected friend and confidant who offered good advice and someone whose judgement was spot on; but had a sense of humor to handle any situation, no matter how difficult. Deacon David Reardon, the current Director of Diaconate Personnel, spoke on behalf of his fellow deacons and noted that Deacon Camacho was a man who not only loved the Lord as much as other, but he lived that love more completely and in a most integrated and honest way than anyone he has ever known. Born in Cambridge, Mass., Deacon Camacho was a veteran of the U.S. Coast Guard and later worked for the federal government General Services Administration in the Boston area for 37 years before retiring in 1994. He earned a degree from Northeastern University and was ordained to the Permanent Diaconate in 1980 for the Diocese of Fall River, Mass. He served at Our Lady of the Cape in Brewster, Cape Cod Hospital in Hyannis, and as the Assistant Director of the Diaconate in Dartmouth. Upon moving to Florida in 2003, Deacon Camacho served at St. Leo the Great Parish in Bonita Springs before moving on to Our Lady of Light Parish in Fort Myers. He also assisted at several other parishes through the years taking on temporary administrative roles when called upon by the Bishop. For the Diocese of Venice, he served as past-President of the Diaconate Council and as the Director of Diaconate Personnel. He was preceded in death by his wife, Lillian B. Camacho; a son, Joseph Camacho and a daughter, Barbara Peters. He is survived by three children, Leo Almeida, Susan C. Franze and Francine E. Camacho, as well as nine grandchildren and five great-grandchildren. A Mass of Christian Burial was celebrated by Father Hugh McGuigan, with Bishop Dewane and other priests present on April 1 at Our Lady of Light Parish. Additional services will be held in Cape Cod, Mass., with burial in Oak Ridge Cemetery, South Dennis, Mass.